Email marketing automation can help you in achieving higher conversion rates. This does not mean that it’s only suitable for sales. What can marketing automation be used for? And just as important how do you implement Email marketing Automation correctly? We round up primary key points for successful application. Conversion is commonly believed to be the same as sales, but that isn’t necessarily the case. Conversion could mean watching a video or signing up for a newsletter reading an informational article. A conversion should be defined as follows: A contact does what you want them to do. This is why marketing automation can be very beneficial for all markets that need to drive sales and conversions, even if sales cycles are short. By nature, responding to what the customers wants, and giving them exactly what they need leads to improved customer experiences and customer loyalty. The probability of getting those conversions grows with every step towards email marketing automation maturity. Starting with a pilot can be very useful. This will lead to valuable experience. You will know what results to expect when you start large-scale implementation. Are you still sending the exact same email to everybody? If so, it is wise to start with targeted marketing as a second step in Marketing Automation. The image below depicts the various stages of email marketing automation. There are many software platforms that provide elements of marketing automation. The trick is finding that one platform that best matches your organisation and needs. Sales and marketing departments will have to jointly determine what the primary process is, when it comes to converting a lead into an opportunity into a client. Marketers also need to consider what they are realistically able to do by themselves. Will it be inhouse or outsourcing marketing automation. And the available amount of time to spend. Do you need any kind of consultation in order to determine priorities. You can, of course, set up the entire process yourself, but you can also hire a marketing automation or email marketing agency to do so. Marketing automation can be made extremely complex by using every conceivable channel right off the bat. But it might be better to start small and keep things simple at first. In doing so, everything you do stays manageable and makes for easy adjustments. Testing and optimization is particularly important in this stadium too. You can’t say in advance that making all call-to-actions and buttons red will lead to improvements, same goes for the setup of your processes and campaigns. It is easy to start off with (too) big ambitions and equally big set of feature requirements. You may see results after as little as a week. But actually building profiles takes time. Imagine you’re a tour operator. There aren’t many people who go on holiday ten times a year. But by building profiles and gauging behaviour and interests throughout the year, you can get an idea of when someone is eager for a sunny destination or a sporty winter holiday. By building profiles you can send more relevant messages. However, keeping an eye on people’s interests and responding accordingly is not enough. Sometimes people themselves don’t know what they’re interested in. Take mobile phones and tablets for example. Before they existed, people didn’t know they needed or wanted them. Focus on predominantly relevant information in your emails, but add some additional information in a separate column. By monitoring their interaction with the topics and whether or not they click on it, you are able to unveil new, additional interests. If you start using marketing automation, determining very clear key performance indicators (KPIs) is vital. 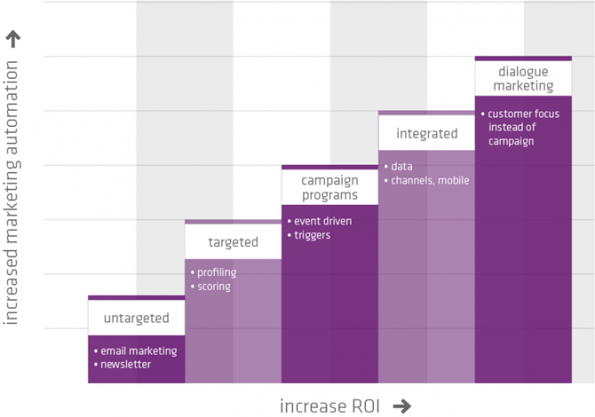 Which aspects determine the success of your campaigns and are relevant enough to be measured? KPIs enable you to optimise your activities. They also allow you to quickly make adjustments if it becomes apparent that you won’t achieve the goals you set. If you assess after every campaign, you can make timely adjustments. Same goes for your Email Marketing Automation application, set the right process and business goals and watch your program grow from pilot to email marketing automation maturity. Jacco Bouw is CEO at webpower, an international player in smart email marketing and marketing automation solutions. With offices in the Netherlands, Sweden, Germany, Spain and four offices in China. During his professional career Jacco has focused on developing the email marketing industry in the Netherlands and China. This led to being awarded the Dutch EMMA in 2007, the Dutch Online Media Man in 2011 and one of the Dutch Wereldveroveraars (Dutch entrepreneurs who have successfully expanded their business abroad). Jacco is author of the book “Face I.T.- marketing to China’s netizens”.